Geometry used to be one of my favorite subjects in high school. We had a fantastic teacher and she would always explain everything so clearly and to the point, I loved her classes! 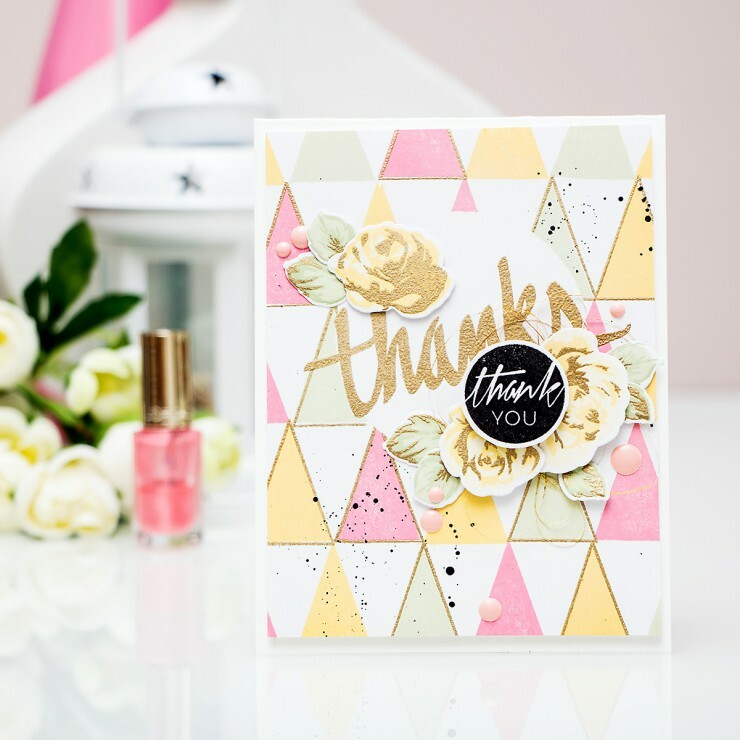 No wonder I now love geometric backgrounds on cards! I started working on this card by creating a circle mask out of thin printer paper. 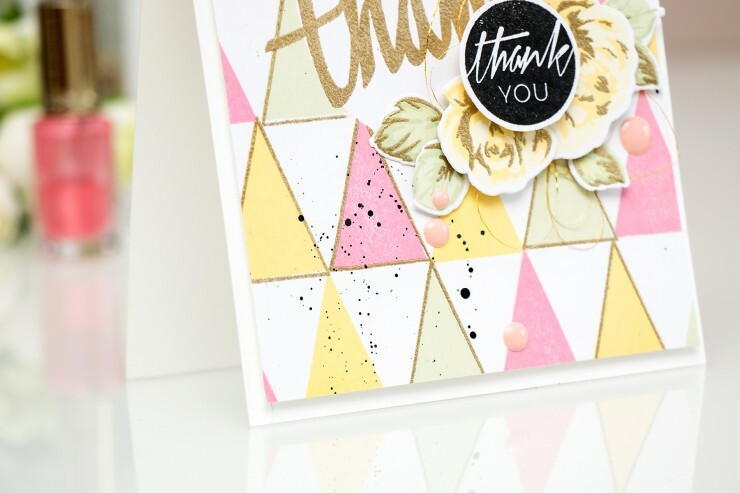 I masked a portion of my background panel and stamped a pattern using a tall solid triangle stamp from the Sohcahtoa stamp set. I used 3 colors of ink for my stamping – Coral Berry, Frayed Leaf and Warm Sunshine. I went with light colors as I wanted to have more of a pastel looking background. I was going for a random pattern look and to add to the randomness I also added a few triangle outlines in gold embossing powder. 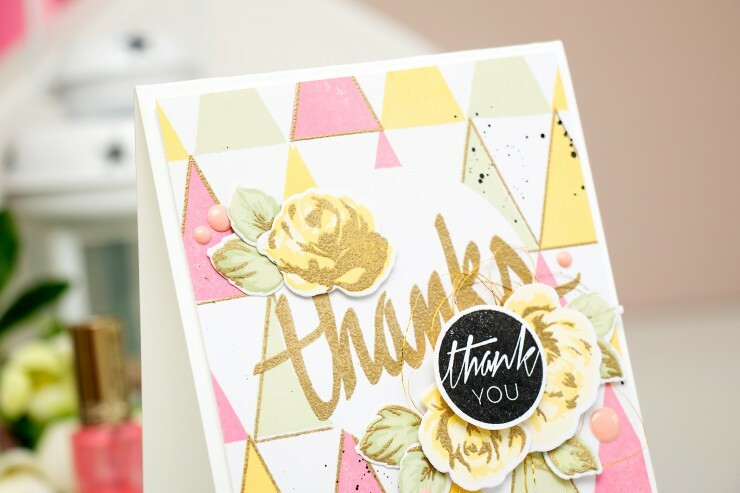 I also used the same gold embossing powder from Hero Arts to heat emboss a bold thanks sentiment. For my vintage roses and leaves I only used 2 colors of ink – a light and a medium. Instead of using a third darker color I went with gold embossing powder. I love the look I was able to create, never seen it before and so happy I got to try it. I am sharing a video tutorial for this project showing you how to create it from start to finish and sharing lots of useful tips along the way. You can watch it here, or on my Youtube channel. Enjoy! Like my video? Please give it a thumbs up and share with crafty friends. Thank you! Yana your such an inspiration and enabler lol I just love your cards…. Beautiful as always. Love triangle pattern behind the natural soft edges of the flowers, such a great contrast.